Game Description: In a city filled with superheroes, getting to crimes becomes a competition on its own. Fortunately there are enough rockets, bombs, grappling hooks, spikes, and other goodies lying around -- to make the competition fun and fast. Welcome to SpeedRunners. 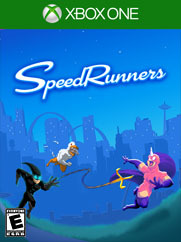 SpeedRunners is a 4 player competitive platformer with grappling hooks, power-ups, and interactive environments. Run, jump, swing around, fire rockets, grapple onto people to knock them off screen.